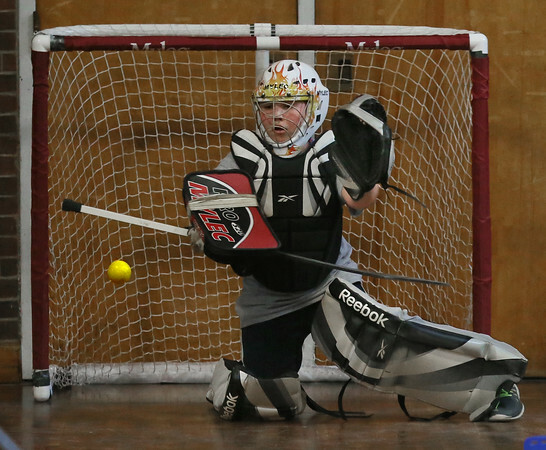 Fourth-Grade goalie Ethan Mahoney of the Wrist Shot Weasles tries to make a save Wednesday during an after-school game with the Purple Pucks in the Beeman Memorial Elementary School foor hockey league. The Pucks, led by captain Jeff Stauffer, beat the Weasles 3-0. The after-school floor hockey league is a tradition at Beeman, started over a decade ago by physical education and health teacher David Connerty. Six teams of third- through fifth-graders, with names like The Flying Penguins and The Cow Tipping Dwarfs, began their regular season in late January, meeting after school on Mondays, Wednesdays and Fridays. Playoffs begin later this month, with teams competing for the prized Beeman Cup.